Back in 1980 at GenCon XIII, Wizards of the Coast debuted the original set of Slave Lords modules for Advanced Dungeons & Dragons. They were used as part of the tournament and each of the four original sections were designed with specific, unique and targeted scenarios to challenge players quickly, while also offering a strong sense of engagement. Now, in 2013, Wizards have repackaged the mods and even wrote a special prologue entry (titled A0) and released them all in the Against the Slave Lords collection. Wizards of the Coast were kind enough to send me over a copy to review, so I’ll break down the general elements of the collection, then each module separately, with a wrap up at the end. I’ll make sure to not spoil any specifics of what to expect – as even DMs should have surprises from time to time. This will mostly serve as an overview of the contents with final recommendations at the end. The first thing you’ll notice as soon as you see the collection with your own two eyes, is the wonderful hardcover design. It’s sturdy and well-made, worthy of bearing the D&D name. The cover even sports nice engravings that are etched into the hard cover, giving it a wonderful textured feel that seems both classic and cutting-edge in style. Each module is authored by a different writer, which is mostly a good thing. It means that the game design elements and encounters always feel varied, but it also means there is a bit of a disconnect in style. However, this really just comes down to a matter of taste and/or preference. A lot of work has gone into making the plots flow from module to module, so you don’t really have anything to worry about. 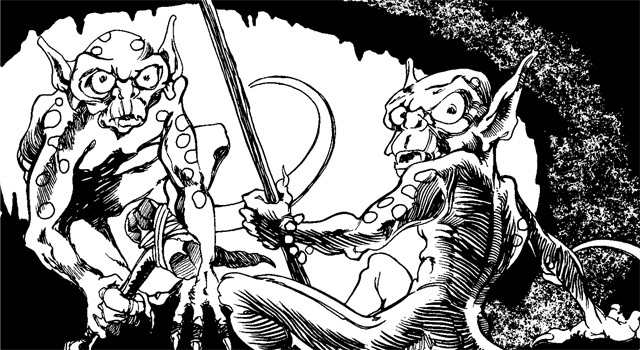 One of my other favorite elements, which may or may not turn away modern D&D players, is the wonderfully reproduced black-and-white drawings. None of this high-color fancy art work with the high-dollar color parts, no sir, pure lines and white space right here; it looks fantastic. Somehow, the detail stands out even more when the image only has it’s lines to shine through. The front matter of the book also contains a foreword from the individual author of each book and the back matter is a nice compilation of drawings. During the original tournament, Wizards actually had fans submit their drawings and they chose the best ones to feature right here in this compilation. I could be wrong, but it seems like modules that were written for AD&D are, across the board, better-written and more creative than the ones that are realized today. The exact cause of this I’m not sure of, but everything in this compilation seems to strike a perfect balance between offering detailed descriptions and highly creative writing, while also allowing plenty of room for imagination and experimentation. What’s more, is that the content is so good, even if you aren’t versed in the AD&D ruleset and play 4th edition or something else today, the storylines and content are creative enough to warrant adapting them to a new ruleset. Next, let’s look at a brief rundown of the individual modules, along with their tasty flavor text descriptions. This prologue was actually written specifically for this re-release compilation as it was not part of the original tournament set. Since the original four-set was introduced as standalone-esque adventures for use in a convention setting, a true prologue wasn’t necessary, but is a welcome addition. A wonderful job has been done capturing the same vibe of the originals and it feels like it would have been there all along. Brugbok, a half-orc, serves as the key villain in this mod and the ending leads directly into the original. 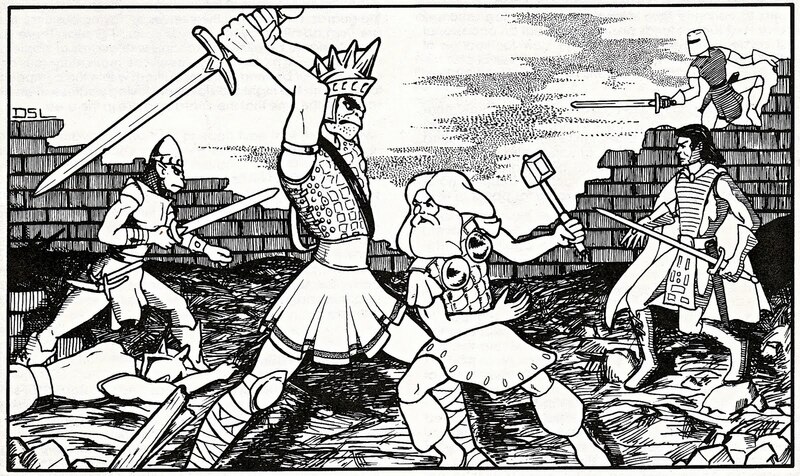 The Against the Slave Lords module set is a wonderful return to AD&D style adventures and is a great reminder of how the game became so popular in the first place. 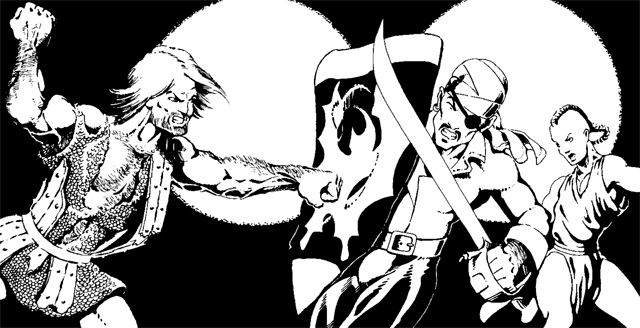 The fantastic black and white art looks just as great as ever, the detailed plots are immersive and engaging and having them all in one nice ~170 compilation is a delight. It doesn’t get much higher quality than this and you don’t have to have AD&D experience to enjoy what’s on display with this one. You can check it out on the official website right here. Did you play this at GenCon back in 1980? Are you going to pick it up now? Let us know your thoughts down in the comments below!